As mentioned in the previous post, this weekend’s baptism was the perfect opportunity to try out some new recipes on unsuspecting relatives. On Friday night, we had a lot of people arriving throughout the evening, so I wanted to make something that could be ready whenever guests arrived. I also chose this recipe because I could do all my food preparation in the morning and was free to great my guests as they filtered in later in the day. To speed up the process in the morning, I chopped the onion and garlic in my mini food processor while the sausage and beef were browning. I first found this Slow Cooker Bolognese on Framed. 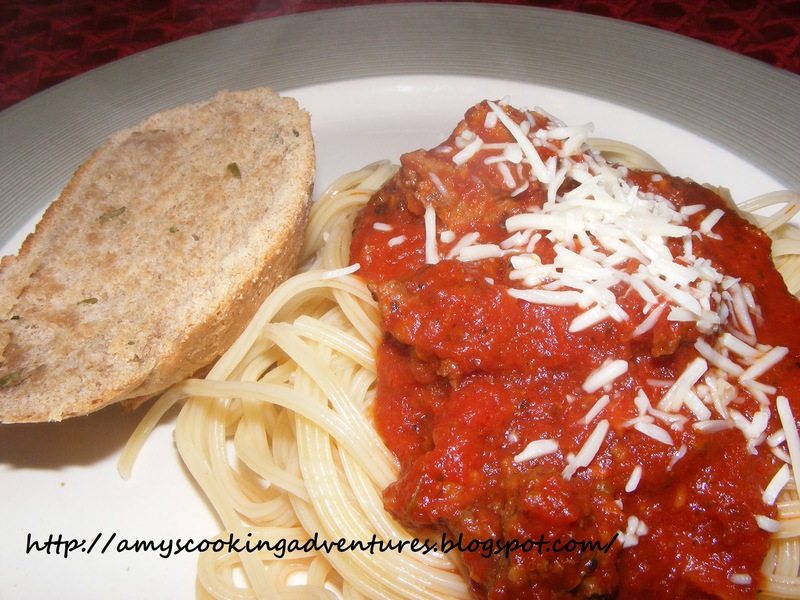 I made just a few adjustments to this recipe, substituting 1 pound of Italian sausage for 1 pound of beef and crushed tomatoes for chopped (because we all know that I do not like huge chunks of tomato in my sauce). The delicious sauce was so easy to make and dazzled my family. I only ended up with 7 of my guests on Friday night, so I have plenty of leftovers. 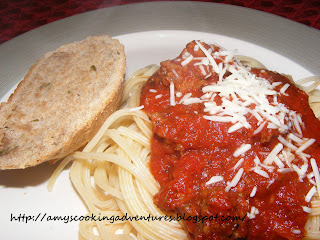 I will able to serve Spaghetti with Bolognese another two times for my small family. This one recipe could easily serve 12-15 people. It could also be halved easily for a smaller family (or fewer leftovers). Transfer to a 5 quart slow cooker. Add remaining ingredients and mix together. Serve on top of spaghetti, sprinkle with parmesan and serve with breadsticks or your favorite bread (I used Rosemary Basil Bread).